In a portion of the state of Connecticut there is a geological formation known as the Hartford Basin, which the USGS believes may have gas, but of limited and questionable quality, suggesting it would not be economic to drill or frack anytime soon. Some in the state have called for a ban on fracking as a precaution. On March 27, 2013, the Connecticut legislature's Environment Committee voted to forward legislation banning the possession or storage of fracking waste in the state to the House of Representatives. Part of Connecticut is in a geological formation known as the Hartford Basin, stretching 34 miles long and varying in width from three to 15 miles. The entire basin lies under the Connecticut Valley from roughly the Vermont border to the Connecticut shoreline. Geologists say the Hartford Basin is unlikely to be replete with gas: a good portion of the basin was overheated from volcanic activity, which likely vaporized any oil or gas, while other places were not heated enough to produce gas. Geologists therefore say it is unlikely the deposits will be extracted anytime soon, because they are probably too small, scattered, and of questionable quality. Texaco did exploratory geophysical work in the 1970s, and then paid for work in the 1980s to examine the hydrothermal history of the Connecticut Valley, but no further exploration took place. In June 2012, a US Geological Survey report assessed five East Coast basins, but only mentioned the Hartford Basin. Washington, Coventry and Mansfield counties have imposed laws to keep fracking waste out. ↑ Gregory B. Hladky, "Environmentalists in Connecticut Look to Ban Fracking: Concerns About Hydraulic Fracturing," ct.com, July 31, 2012. ↑ "Conn. bill advances banning fracking waste," AP, Mar 27, 2013. ↑ 3.0 3.1 Beth Daley, "Western Mass. 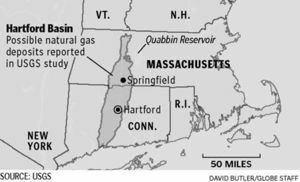 viewed as territory for fracking," Boston Globe, Dec 13, 2012. ↑ Anna Bisaro, "Connecticut towns raise concerns about fracking waste; Branford could become 4th to ban it," New Haven Register, February 6, 2016. 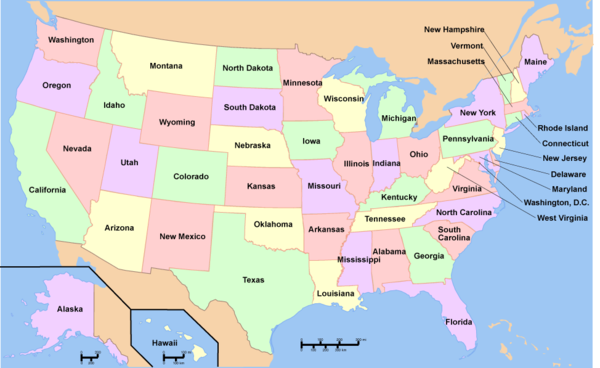 Wikipedia also has an article on Connecticut and fracking. This article may use content from the Wikipedia article under the terms of the GFDL. This page was last edited on 9 February 2016, at 22:16.